This September marks a melancholy anniversary: the first of the month is the centennial of the death of Martha the pigeon in Cincinnati zoo and, with her passing, the extinction of the passenger pigeon. It was an extinction that 100 years earlier would have been inconceivable. This was a species that moved in flocks of billions of individuals, so dense as to blot out the sun and take days to pass. … The anniversary has been marked by the publication of three very different books, all focusing on how a species can go from sky-darkening abundance to a single, aged individual in a matter of decades – and what this may tell us about the future. The passenger pigeon or wild pigeon (Ectopistes migratorius) is an extinct North American bird. Instead, as Joel Greenberg shows in A Feathered River Across the Sky, it was habitat destruction that largely did for the species [though incredibly aggressive hunting also played a role]. Accustomed to peregrinations in search of patchy and ephemeral resources, passenger pigeons simply couldn’t adapt to the newly deforested, industrialising landscape of 19th-century North America. This, plus the odd fact that pigeons left fattened, ground-foraging young to fend for themselves for the last two weeks before they could fly, ultimately led to their disappearance. 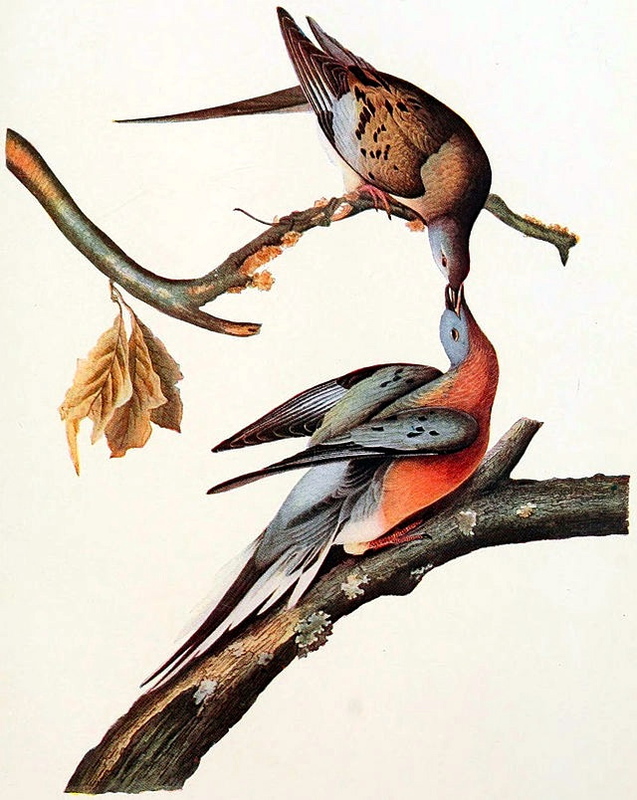 The demise of the passenger pigeon, culminating in Martha’s death, has been widely covered recently, for instance in the NYT Sunday Review of August 31st, in “Saving Our Birds” by John W. Fitzpatrick. This entry was posted on September 5, 2014 at 5:02 am and is filed under Books, Language and animals. You can follow any responses to this entry through the RSS 2.0 feed. You can leave a response, or trackback from your own site. East of Knoxville TN the Pigeon River and the tourist trap Pigeon Forge recall the days of the passenger pigeon. Although the New Scientist doesn’t indulge in its very frequent punning here, it does have a certain amount of language play: the cliché beautiful but doomed (applied to many objects and people, like the Nokia N9 and James Dean), plus the alliteration in hubristic humans … heed.